A Butterfly was caught having a moment with Hashtag Franco’s girlfriend during the cremation day. There is an old sayings and beliefs that butterfly symbolize the spirit of a person who wants to say something to it’s love ones. If the sayings is true, this phenomena is just a proof how Hashtag Franco loves his girlfriend so much. it’s been almost a week since Franco Hernandez left us due to tragic drowning accident which really shocked everyone since it was so sudden thinking that he’s just 26 After the sudden death of Hashtag member and fellow It’s Showtime host, Franco Hernandez gains much sympathy from the fans grieving for his loss. Died at a young age of 26 on a freak accident happened during a supposedly fun vacation in Davao Occidental, fellow Showtime hosts grieves over the loss of a friend and a brother. Facing an issue regarding Joey De Leon’s alleged shady IG post, what made this story more sensationalized is when Franco’s girlfriend posted her IG story on her social media account. The girlfriend, whose IG username is @janicanam, shares a series of picture stories on her IG account, recalling all her sentiments over the death of her beloved. Because he’s been loved by a lot of people, Franco’s wake became open to the public viewing. As many were grieving during the funeral . But what shocked the people is on his cremation day, out of nowhere, A mysterious butterfly showed up and flies all over the guesses. 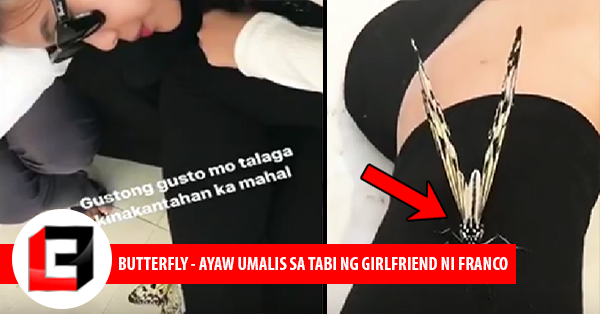 But what caught the attention of many witnesses and Netizens, is the moment when the butterfly went and stayed beside the grieving girlfriend of Hashtag Franco. It seems that the butterfly wanted to tell something to Hashtag Franco’s gf, it seems that the butterfly doesnt want to go anywhere but to this girl’s side, Forever.